Last weekend at Ad Astra, a convention here in Toronto, I had the opportunity to meet and interview Jim Butcher, bestselling author of The Dresden Files and Codex Alera. We talked about all manner of things from talking cats, epically epic epic fantasy epics, and zombie t-rex’s. Now, I’ve done something slightly different with this interview. Attached below is the audio recording for this interview (with some minor edits to it, but it’s largely untouched). I encourage you to take a listen (and ignore how awkward I sound). There are a couple off-topic moments on there which didn’t make it into the transcript, but I think it’ll be much more fun to have a listen than to read. Let me know your thoughts! Anyways, as per usual: J = Jim Butcher and R = Myself (Rebecca). R: I’m here with Jim Butcher, bestselling author of The Dresden Files. Jim, can you tell us something about yourself that we might not know? J: Hm.. That you might not know.. The people at both of the Burger Kings near my house know who I am by sight and will say “Hey Jim, how’s it going?” and “How’s the next book coming along?” whenever I go there. That’s how often I’m at Burger King. R: Alright, that’s certainly interesting. 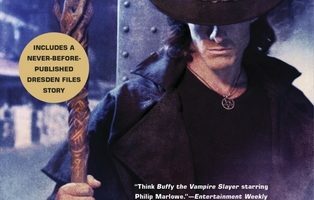 Now, you have The Dresden Files which was adapted into a TV series, which you weren’t a huge fan of, or there were some issues there… How would you have envisioned it if HBO or someone else had the rights for it, or if you had made it into an anime? J: As an anime I think it’d be great; in my head it’s an animated thing anyways. But if HBO was going to do it? I don’t know, I wonder what would happen if HBO did it. I would probably just sit back and smile regardless of what happened. It would be really neat for something with a bit more production value to take over on something like that. That would be completely awesome. That was one of the big problems with the SyFy series was the budget was low enough that it was difficult to get enough actual magic magic into the show. R: Yeah, I noticed that… And this next question is one that another fan asked me to ask you, but will we ever see Faith from the Restoration of Faith short story in a mainstream Dresden Files book? J: Yes, we will, but not until the big ending. Faith was the first character and more or less the first client of Dresden’s that I ever wrote in that first little short story. So she will show up again to kick off the big apocalyptic trilogy at the end. R: Alright, and can you tell us a bit about this next novel? J: The next novel is called Skin Game. In it, we find out that Mab has various debts which she has incurred over the years and Mab is very keen on getting her debts paid, and when one of the people she owes shows up and asks for a favour, she loans him Harry Dresden in order to help him. So Harry is going to find himself, by command of Queen Mab, assisting Nicodemus Archleon in a heist. They’re going on a bank job, and they’re going to knock over the vault of Hades — the Lord of the Underworld. Harry is going to be very far out of his element because he’s going to be working with this crew of nasties that Nicodemus has recruited and having to survive that situation, and it’s going to make him look so good to the White Council and everyone else that he’s running around with this crew. J: Yeah, cause that’s his life… So that’s going to be our general plot, we’ll have to see what happens from there. I have a general idea of the mayhem that’s going to work out, but I’ll have to get to the nuts and bolts of it as I write, and I haven’t opened it up yet. R: Yeah, though you’re expected to have the first two chapters in a few weeks, I think? J: I have to have the first two chapters done by the end of April so that they can go into the back of the paperback of Cold Days. R: Good luck with that! Now, this is going to be the 15th book, how has your outline process changed since the first one? And how do you keep readers interested, and keep coming up with ideas for these books? J: When I first outlined the series, I outlined 20 books and I said: “Here’s the kind of plots that I want to have … here are the kind of bad guys that are going to be showing up … the kind of big events that are going to be happening…” And I’ve still got the outline at home which is something I wrote as a class project long ago, and now, as we’ve gone on the books have done very well. I see no reason to fix it if it isn’t broken, so I’m still using those outlines. Which is just stuff I came up with a while back, and basically it’s just fun, like: “I want to have Dresden in prison in this story!” or “I want him in an insane asylum with no magic”. You know, and these are things that I’m hoping to have happen as the series goes on. R: It is certainly interesting, because they’re each all unique while they have the same feel. J: Yeah, and that’s kind of the point. It’s one of those things you have to do as a writer; if I just wrote the same thing over and over and over again, I’d shortly grow sick of Harry and throw him over Reichenbach Falls. Instead I try to throw these slightly different stories and try and give it a bit of a twist every time. R: And is there a main source of inspiration you got for all of these ideas? J: I give Harry the beatings of Indiana Jones… as far as the main source of the ideas, it was pretty much just ‘Monster of the Week’: what kind of monster do I want to deal with this week? Book 1: Evil wizards; we have good wizards, and so we’ll have evil ones and that’ll be the first bad guy. The next bad guy? Werewolves, and the next one ghosts, then I want to do fairies, then I want to get into demonic evil guys, cause I’ve come up with these Knights of the Coin and so on, and then more vampires in Book 6, and I want zombies in book seven, and that was kind of how far as the outlines went for a long time. Then, the challenge was to take those outlines and these fun things I wanted to have the character do, and work those into the story in such a way that they’d be a good time for the reader as well. J: Yeah, and there’s no upper limit to how much crap I can dump on Harry Dresden, the poor guy. I mean, generally anything that can make his day more miserable needs to get written in and then I get to think of a way to make it even worse, or at least even more insulting as it happens. R: Delightful… Challenge your rage at him much? J: Oh it’s not my rage! I love the character, if I didn’t I wouldn’t be doing this. R: Now, what’s your opinion on the transformation of books into the digital age where e-piracy is becoming of a thing, and people can just download a book, and upload it elsewhere for free? J: Well, I actually tracked three different sites which were major torrent sites, to see how many people grabbed the torrent for The Dresden Files. As it turns out, about ten times as many people steal the book as buy the book, and after asking around the industry, they’re like “Yeah, that’s pretty normal”. For a long time that bugged me, but at the point I’m kind of at now is that a lot of people who steal the book wouldn’t have paid for it anyways. And if some of those people read the books and are like “Oh, hey man, these are really good; I need to go get some more of these.” or “I need to actually pay for these.” then I’ve picked up customers I wouldn’t have had otherwise. I like to think of it as involuntary promotional copies that are going out over the internet, and try not to let it stress me out too much. It’s not something that I want to do, or want to encourage, or that I think is good, but I can’t do anything about it anyway so I might as well not give myself ulcers worrying about it. J: Right, well, that’s something I’ve never had a problem doing. I’ve occasionally gotten a fan letter from someone who’s serving over seas – especially if they’re actually in service, and I’d say “Hey, dude, here’s the next book. It’s already finished, it won’t be out for eight months but here you go.” and I have no problem doing stuff like that. R: Yeah, it’s always nice when authors actually do that, you know? J: Yeah, or sometimes I’ll get word that people are sick, and maybe too sick to be able to be around when the next book comes around, and I’ll be like “No, I will give you this book, here you go.” It’s not a big deal, and doing stuff like that… I mean, when you’re just trying to be kind to people, that doesn’t cost you; that pays in the long run. R: Indeed! And it’s good, you’re harbouring good will with the readers, and you seem like the kind of guy who, enjoys spending time with fans. J: Exactly, they’re real people. At the end of the day, my readers are my patrons. Artists have always had to have patrons to be able to do what they do, and it used to be that you had one particular lord that you had to please, and then you’d be alright. Instead, I’ve got a couple hundred thousand patrons that I make sure I try to take care of. As long as I do that, I’ve got the support of all of these readers which is a fantastic thing. That’s why I try to pay attention to them, and sometimes ask: “What would you like to see more of in the books?” and put that in there, on account of: I want to keep eating. R: Yeah, eating, paying rent, bills… Kinda important… Burger King. J: Yes.. Shakespeare’s gotta eat. R: They’d miss you if you weren’t there! R: Oh dear, the thought! R: So… Epic epic fantasy epic? Anything you’re willing to say or share about that? J: I’ve always wanted to write an epic epic fantasy epic. When I started off I wanted to be an epic fantasy writer; that’s what I wanted to do. So, I’ve got this in mind – this epic epic fantasy epic that I want to write one day. It’s humans, elves, hobbits and dwarves, although it might not look like that, really, it’s a Tolkienesque kind of epic, or at least, it starts off that shape. I want to write that when I’m good enough; it’s not something that I’m ready to do yet, so instead I’ve just been running roleplaying campaigns in it for the past many years. Which is great, because I’ll pick another part of the world and I’ll have some vague idea of what it looks like. Then I’ll start running the campaign there, and of course if you’ve got player characters they never do what you expect them to do – they never do the smart thing. They do the thing that seems appropriate to them based on what they know. So then I feel like I’m frantically running ahead of them with a load of lumber, canvas and paint, building these sets six feet in front of them just before they open the door. It’s a good creative exercise which has helped me get this world established in my brain. But yeah, I do want to write a big ol’ Martinesque huge fantasy one of these days. I don’t know when, but I’m going to do it. My epic epic fantasy epic. R: Yeah, I wasn’t sure I got all the “epics” in there. J: I thought about calling it an epic epic epic fantasy epic, but that seemed a bit over the top. R: An epically epic epic fantasy epic? J: Epically epic? Well I don’t know if I could be epically epic, I mean, I’ll be happy to just be moderate epic… but you can’t call it a moderate epic fantasy epic, it doesn’t work. R: No, and you’ve always got to exaggerate. J: It’s one of the first laws of writing. 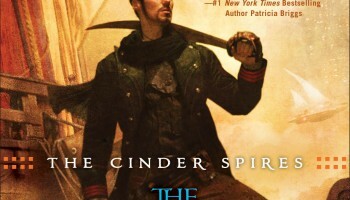 Now, you did recently sign an agreement for a steampunk trilogy… Is there anything you can say about The Cinder Spires? J: The Cinder Spires has gotten a better response from my readers than anything that I’ve done recently, just in terms of them thinking it’s something cool. These are my beta readers, from the beta asylum, which I call the asylum because you have to be a bit crazy to be there, because I’m just a bear for cliffhanging chapters, and sometimes they’ll have to wait a couple of weeks between them. So, there’s something wrong with those people, but there they are. They think it’s pretty great, it’s kind of “Hornblower” meets “League of Extraordinary Gentlemen”, it’s very focused on the characters, with very strong influence from Firefly I think. J: Yeah, if you’re going to steal from somewhere, you know, pick a good spot. But yeah, we start off with a disaffected ship captain who used to be part of the navy buy got drummed out of it for being an up-right honourable guy, who’s now running his own ship. We’ve got some other characters who are scattered around who are being drawn together by the lord of the spire. Everyone lives in these enormous spires that spire for miles above the ground below; the surface is this deadly place you don’t want to go. The lord of Spire Albion, which is where the story begins, is assembling what is essentially a team for critical missions. That’s what this first story is, it’s him drawing this team together, and dispatching them as this war is beginning with a neighbouring spire of jerks. So that’s kind of where we get going. One of the team members is the daughter of one of the young noble houses, and one of them is her cousin who is warriorborn. They don’t know quite how it happened but a certain percentage of the popular seems to be born with what seems like genetic modification to be faster and stronger and better and cooler. As well, there are cats in the Spires who talk and who are just the most arrogant, annoying little bullies. R: Well, yes… They’re cats. J: They’re cats, exactly, but these cats can talk, and they have opposable thumbs and matches. So, these are cats who are along the lines of: “I see that you enjoy having no rodents in your warehouse. Perhaps you would continue to enjoy having no rodents in your warehouse. Perhaps there will be a bowl of cream sitting out for me… or it might all catch on fire.” You never know what’s going to happen, but one of the characters actually has a close relationship with a cat and can speak cat. The cats speak their own language, they probably could speak the human language, but why would they? They’re cats. Why would they stoop to that? They understand humans, perfectly, except for when they don’t… and that can all happen within the same morning. They can choose who to ignore and who not to. The cats are horrible. Then we’ve got these wizard figures. All the technology is based around these crystals that can channel various forms of energy, steampower and a kind of Frankensteinian electricity. They’re engineers who can do all kinds of cool stuff, but they’re also these figures called etherealists who work with the crystals. The etherealists are all completely nuts, I mean, over-the-top hair on fire nuts. Except for the ones that aren’t, and those are the ones you really have to worry about, because there’s something really wrong with them. You know, the guy who’s sort of dribbling and walking in circles in the corner, who’s an etherealist? Okay, he’s probably not a threat. The one who’s inviting you to high tea? Forget it, you don’t even want to go near that one. J: Exactly; you know they’re crazy, the question is: how? And if you can see they’re crazy, they’re less dangerous. But yeah, that’s sort of them getting this team together and figuring out how they’re going to get things done. I’m having a great deal of fun with the book, it’s been a tremendous good time for me, so my beta readers have been tortured extra. Which I think is good for readers. R: Of course, especially beta readers, they deserve it. This sounds like it’s going to have quite a bit of a different feel compared to Dresden. J: Very much so. It’s going to be closer to Alera than anything else… Multiple character viewpoints, so it’ll have much more of that feel. R: Now, how has your writing process changed? You said you already had the outline done for The Dresden Files, but over the years have you found that your writing process has since that first one compared to your latest novel? J: I use outlines a lot more — when I’m being smart — to get things laid out ahead of time, and avoid those long stretches of “Why isn’t this chapter working?”. It’s really handy if you have an outline, it helps avoid that. I don’t drink coke so much anymore; the caffeine and sugar were doing bad things to me and eventually started catching up. So, there’s less coke. Other than that, it hasn’t really changed. There’s TV, I work at night, I don’t know why that’s when the magic happens, sometime between 11PM and dawn. There’s always a bad movie on in the background that I keep track of. So that I don’t have to look up except for the parts that I really like, and otherwise I can be focused on the work. For this particular book in The Cinder Spires, it’s been Star Trek 2 because it’s as Napoleonic as I could get in terms of ship-to-ship combat stuff. R: Yeah, best parts really… Only reasons to actually watch it. J: That and Spock’s death scene, which is one of the better character death scenes ever done. If you’re going to kill a character, that’s a good way to go; that was very well executed. R: Now, out of all your stories from The Dresden Files, Codex Alera, or anything else, which one was your favourite to write? R: Every book needs a bit more zombie t-rex. There’s a disturbing lack of them. J: Yeah, there is, and I don’t see why it isn’t happening more often. R: We’ll have to change that. Now, which was your least favourite to write? J: My least favourite book to write? Ghost Story was really hard because it was so different from the other Dresden books. Not that it wasn’t fun, but it didn’t feel as natural as the other books. The Spider-Man book was really difficult to write because the time constraints were so strict. I think I had about thirty days to write that thing. That was a pretty serious challenge. But that was the year that I wrote three novels and a comic book, the comic book wound up being like 124 pages which was ridiculous. R: You wrote that in thirty days? J: Well, not all of that, just the Spider-Man book had to be done in thirty days, and it was over Christmas too, so that made me so popular with my family. R: Oh yes, of course. J: Yeah, a little bit. R: I’m not sure if you attended conventions before you were an author, but how has your experience changed so far, now that you’re on the “other side”? J: The only place that’s really different is when I come to a con. If I go out gaming, it’s still the same. If I go out LARPing, LARPing is still pretty much the same stuff. I’m not really famous anywhere except for conventions and sometimes at bookstores. I think I’ve been recognized in public once, ever. So really, the only place that’s different is conventions… Coming to cons is cool, because everyone laughs at my jokes, which is a nice change of pace. Other than that, it’s pretty much the same experience. Sometimes people are nervous to meet me, which seems strange because I know I’m just as big of a nerd as I always was. It’s like these guys don’t know; they never saw me sword fighting with boffer weapons up and down the hallways of conventions when I was eighteen. So that’s sometimes sort of strange. I’m the last person in the world you need to be nervous around; I’ve done far more embarrassing things around you. But you just try to be nice around folks, smile and nod a lot, and they’ll offer to buy you dinner. Sometimes it’s dinner number three, but I’ll get some fries or something like that. As far as the actual experience being different? Not too much, really. R: Just more of a sore wrist? J: Yeah, after about three hours I had to go back to the hotel room and pack it in ice or it’d be swollen up tomorrow and I wouldn’t be able to sign. But really, what a great problem to have. J: Yes, it’s awful! But I mean, I feel like I’m just as awkward as I always was. I guess I can kind of go into “Author Mode” a little bit easier where I’m doing the talk in front of people, doing the jokes and the one-liners, and that’s fun. That’s not really something I do because it’s fun for me, I like making people laugh, and that’s a good thing; to be able to put a smile on somebody’s face… That’s worth doing. R: And do you have any advice for anyone who wants to get into writing? 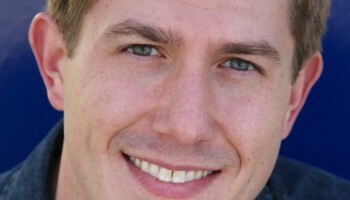 J: Yeah, go by my Livejournal at http://jimbutcher.livejournal.com/. There are all kinds of articles that are geared towards beginning writers which is the stuff that my teacher taught me when I was bound and determined to prove to her how wrong she was about writing, and as a result, wrote the first book of The Dresden Files. There’s a lot of interesting stuff there. The main thing though, is that you just have to write and ignore when people walk up to you at your family holiday gatherings and say, “When are you going to get a real job?” Oh man. I had a cousin and that was his favourite thing to say for like twelve years. Finally when I got my second series sold, and started being able to support the family on the writing, you know, I decided not to get a ‘real’ job. I’m just going to keep this job. R: I think you’ve made a good choice. The rejection process is one of those you kind of transcend and look back at it and go, “Why did I make such a big deal out of that?” But anyways… Write, write, write. That’s my first advice to newbie writers. Keep writing; don’t stop. R: Alright, thank you, and I think that’s it… Thank you! 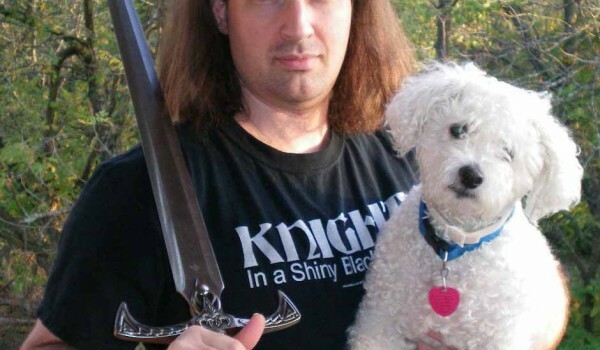 Sorry to break it to you Mr. Jim Butcher, but in my book you’re writing an epic epic fantasy epic series. Dresden is by far imo the best. My friend recommended the Dresden Files books for 3 years before I decided to read them. I didn’t really want to pay for them so I found the first 2 books online and decided that if I like them which at the time I didn’t really believe I would. After the 1st book I burned through the 2nd in about a week reading it anytime I had a free moment. Loved the first two books so much I went and purchased every book since even the comics and short stories. Still my favorite series. Also love the Drizzt series as well. But Harry has a very special place in my heart and I’m do glad my friend recommended them and didn’t stop bugging me to read them. Now I in turn have gotten probably 30 people to read them myself and they in turn have gotten more people as well. Love the series and can’t wait for Skin Game. Very excited. I was curious if it was ever mentioned, do half price books/ reselling books hurt sales much? I know they have minds hard at work figuring out the details of the “lost liter” I know game developers are up at arms about game stop and its pushing resold games over new. oh well interesting stuff @. @’ keep up the good work.. Awesome interview! I want to read the epic epic fantasy epic; though always think every series is hard pressed to top Dresden. Same, I’d be interested in reading an epic epic fantasy epic. Even if it didn’t top Dresden, I have no doubts it’d be an excellent read. Feel a little guilty about downloading his books, but the fact is I already own the entire series in hard copy, and every one of them from Changes onward in hardcover. It’s just nice to be able to carry all of his work everywhere I go in my iPad, every time I feel like rereading a particular book or scene. I’m a poor student too, so I can’t afford to pay twice for what is essentially the same thing. Yeah, it can be difficult to pay for books twice. It’s one of the reasons I like what Amazon is starting to do — where if you buy the physical copy, you can get the ecopy free, or at least at a discounted rate. I love his work, so much. Great interview! “Mostly, I try not to think about it too much. 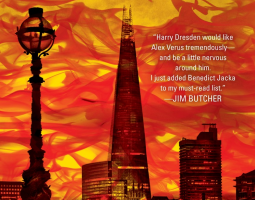 A one-month survey of five popular PTP file sharing sites showed me that unpaid downloads of the Dresden Files outnumbered the paid downloads by something like thirty to one. It’s a little bit of a sting to know how many people are stealing my work. That said, I try to look on the positive side, and regard those downloads as involuntary promotional copies. If a few of the people who take my stuff get addicted to the series and eventually find themselves buying copies, then it hasn’t been a total waste, and that’s a good thing. Great interview! one of your sidetracks that didn’t make it in to the transcript was on your writing, but I couldn’t quite make out the kind of pen you use, what is it? Thank you! I’m glad you liked the interview. :) I tend to use fountain pens and dip pens/quills when possible. Great interview. It was nice to both read it and hear it. thanks for the interview. got the plot of the next book. thought nico wont show his face after last time. One of my top five favorite authors. Thanks for the reblog! :) I’m glad you liked the interview. When was the last time you read an epic fantasy saga that was one self-contained volume, with all of the sweeping adventure and huge mythic sacrifices in just one book? These days, it seems as though any epic fantasy has to be at least a half-dozen volumes, and this often appears to be driven by marketing as much as by storytelling needs. Never got the chance to look into his books. I really enjoyed your interview and have to add him to my reading list. You will not be sorry! I just insisted that a friend of mine read the Dresden Files, and they are her new favorite books. Awesome interview! One of the better ones I’ve read lately. Thanks Shane! I’m glad you liked it… I hope you found it to be worth the wait.